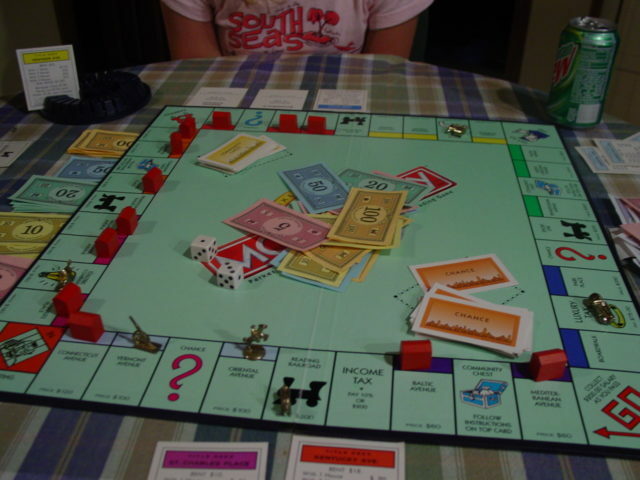 Board games like Monopoly have been a popular pastime for adults and children alike for decades. Properties have been bought & sold, houses built, and rent collected across the 40 space board for over 75 years. Thanks to some special stipulations — aka new Monopoly game rules — your next Monopoly match will be as fresh as the latest release for Xbox 360. Added fees are one way to spice up the game of Monopoly. For instance, ‘sloppy dice’ requires a $50 payment to either the bank or the center jackpot by any player who rolls the dice off the board. While the official Monopoly rules allow for multiple game pieces to be on the same space at any given time, what if you required the second or third competitor who lands on an already occupied space to pay $50 to the first arrival? This makes the trip around the board a little more exciting, doesn’t it? Double rent is already claimed by land owners who control an entire patch of properties, but double houses and hotels can generate an even more heated contest among players. This allows you to add 4 more houses — or an additional hotel — to make your assets more adversarial to your opponents’ bankrolls. A hotel with a house would combine the hotel rent and the rent for one house. This would step right up to a double hotel, which would cost any squatters twice the hotel rent! Typically, 3 consecutive rolls of doubles would land your speeding car or blazing battleship in Jail. However, unlimited doubles would allow for perpetual motion by a player who rolls a hot streak of doubles. It’s no secret that Chance and Community Chest often dictate the biggest moves in the game. Barring ‘Go to Jail’, the standard is to go forward when any other ‘Advance to’ card is drawn. Suppose a game piece has just passed the green properties stacked with hotels. The player lands on Chance and reveals the card marked, ‘Advance to the Nearest Utility’. Under the old rules, this would direct the player to go past Go for $200 before stopping at Electric Company. However, it would make more sense to reverse this competitor’s course to Waterworks, thus giving the owner of the green properties a second shot at a big payday! The deck labeled Chance contains one card that sends players back 3 spaces. Should you pick this card, why not continue moving in the opposite direction of the rest of your opponents? This change in movement would also alter other aspects of the game — including what properties you’ll have the opportunity to purchase, when you should buy houses, and your odds of hitting the Free Parking jackpot (if there is one). To add another twist, there are only 2 ways you can turn back forward after being reversed: (1) You must either be sent to Jail, or (2) You must draw a card that sends you to another space that’s closer by moving forward. House rules similar to these have morphed many times since the first time the Monopoly game was played in the 1930s. Creativity and adding your own combination of these new Monopoly rules are guaranteed to make your next series of laps past Go even more entertaining… and exciting!